After 2/5 Cav was airlifted north, the Battalion spent a week in the Camp Evans area running local security patrols and helping construct the perimeter defenses for the base camp. After a few more days of bridge security and search operations along Highway 1 near Camp Evans 2/5 Cav moved to LZ Jane, 19 km to the north. With the Battalion under the operational control of the 101st Airborne Division, C Company again was tasked with securing a stretch of Highway 1, guarding bridges, providing security for engineers sweeping for mines each morning and running search and destroy missions in the vicinity of the highway. On March 1, 1968, the 2nd Brigade of the 1st Cav relieved the 2nd Brigade of the 101st Airborne and assumed the mission of clearing the enemy elements in the Hai Lang - My Chanh area. Hai Lang was the District Headquarters for the southernmost coastal district of Quang Tri Province. My Chanh, nine kilometers south along Highway 1, was the location of an important bridge over the Song Thac Ma (Thac Ma River) and also marked the boundary between Quang Tri and Thua Thien Provinces. After the 1st Cav took over responsibility for this area, 2/5 Cav operations were widened in scope to the west and the east of the national highway. West of Highway 1 was the Hai Lang National Forest Reserve, a mountainous uninhabited area, heavily wooded with no roads and having very few trails. The Hai Lang Forest was a base area for infiltrators from the north. East of Highway 1 and stretching to the coast was the heavily inhabited area known by the French troops during the First Indochina War as the "Street Without Joy". Bernard Fall, in his book of the same name, described this flat area of rivers, canals, rice paddies, hamlets and cemeteries as "...fringed by a rather curious system of interlocking small villages separated one from the other by often less than 200 to 300 yards. Each village forms a veritable little labyrinth that measures barely more then 200 feet by 300 feet and is surrounded by bushes, hedges, or bamboo trees, and small fences which made ground as well as aerial surveillance almost impossible. The villages are ". . . protected in turn by a vast zone of swamps, sand holes and quicksand bogs, extending all the way to Road 1." There had been little change in "The Street" since the French had unsuccessfully attempted to eliminate the Viet Minh troops during Operation Camargue in July of 1953. Large numbers of NVA had been gathering in the area with intentions of attacking Hai Lang, LZ Jane and the various highway bridges. C Company, along with the rest of 2/5 Cav, had been kept busy with search and destroy missions in the villages between Highway 1 and the coast, as well as road and bridge security. The emphasis, according to the 2/5 Cav History (1968) "... was placed on the enemy's food supply; having taken away his fortress, the Cavalrymen were now attempting to starve him out of the area entirely." 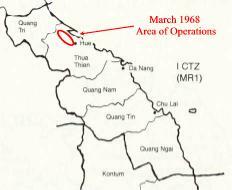 On March 8, 1968 C Company was to search Pho Trach (1), Pho Trach (2) and Xom Dong My, villages in northern Thua Thien Province located about six kilometers east of the highway. It's an interesting fact that the NVA apparently knew we were coming. According to an intelligence alert that the 2nd Brigade received from the 101st Airborne, an NVA POW told his interrogators that 100 NVA had been in Sieu Quan hamlet and 70 had left early on March 7 and had gone to the vicinity of Pho Trach # 1 and #2. They were digging in and laying mines - they had 4 60mm mortars with much ammunition, AK47 auto rifles, SKS rifles, and two fragmentation grenades per man. This information was received by 2/5 Cav at 0055 hours in the morning of March 8. At 1244 hours on March 8 the first elements of C Company making the CA touched down at a green LZ just two hundred meters southeast of Pho Trach (1). The Hueys then departed to pick up the second lift at the My Thanh bridge location. While this second element was in the air, Brigade HQ ordered a mission change and diverted C Company to secure a Conex of "medical supplies" accidentally dropped from a CH-47 Chinook about 1.4 kilometers from LZ Jane near the north bank of the Song Nhung. Remaining platoons were landed at the conex site while the first group of men remained at Pho Trach (1) until 1400 hours when they were finally picked up. After the Conex was found and secured, 1st and 3rd Platoons were sent to clear the surrounding area and to find a good site for a Night Defensive Position (NDP). Meanwhile the following items were recovered around the downed conex: one heavy duty engine; various chairs; three boxes of sundries; poncho liners; one safe; one broken gin bottle; "some beer". No classified material was found, and the safe was unopened. Personnel from LZ Jane arrived to inventory the contents and found there were no losses. Another CH-47 lifted out the Conex at 1720 hours and C Company moved to high ground about one klick to the west and set up their night perimeter, leaving a reinforced squad from 1st Platoon at the site of the Conex' impact. Both the ambush and the company spent a quiet night. In the morning of March 9, 1968 C Company resumed the Combat Assault that had been aborted the previous day. At 0803 hours, the first lift of Hueys touched down to a green LZ at the same location used the previous day. The entire company was on the ground just southeast of Pho Trach (1) by 0841, with the last lift receiving ground fire from a paddy area west of the hamlet during their insertion. An Intelligence Squad arrived at 0930 hours to assist in interrogations. The day started well enough. By 1000 hours Pho Trach (1) had been searched, 200 pounds of rice found and the Intelligence Squad was beginning to question 45 persons who had been detained. At 1100 hours a helicopter was requested to pick up the rice and one detainee. An NVA uniform and over six hundred pounds of rice were turned up by noon and it looked as if the search operation was going to be successful. And then 1st Platoon started receiving fire from Pho Trach (2), about three hundred meters to the north. One man was killed and two wounded by the first rounds at about 1250 hours. The fire increased until by 1315 hours, 1st Platoon was pinned down behind a small embankment. As the Platoon Leader had received a serious neck wound and was not able to direct the men, the company commander, CPT James Estep, with the artillery forward observer, LT Maynard and his RTO Jack Pease, and several other members of the company headquarters section crawled across several paddies to the 1st Platoon location to take control of the situation. A scout helicopter and a Cobra gunship arrived at 1330 hours. Under the cover of the rockets and tube artillery, the casualties were pulled back. One of the wounded men died during this period; the lieutenant was Medevac'd at 1410 hours. CPT Estep was seriously wounded in the leg while 1st Platoon was pulling back and fell exposed in the last paddy before reaching cover. The 2nd Platoon Sergeant, PSG Mable, and a rifleman named Wesley, ran out under fire to carry him back behind a paddy dike. CPT Estep has said "... they worked together like they rehearsed it." PSG Mable, who would himself be seriously wounded five days later, received the Silver Star for this action. After 1st Platoon rejoined the company, tube and aerial rocket artillery (ARA) continued working over the contact area. At 1429 hours the 1st Platoon of D Company was placed under the operational control of C Company and landed at a large cemetery to the northwest of the Pho Trach hamlets to act as a blocking force. Small arms fire continued to come from the direction of Pho Trach (2), and gunships and ARA fired on targets there until 1614 while the company pulled back about two hundred meters and set up a perimeter. Battalion Commander LTC Joseph B. Love landed, bringing with him a replacement for CPT Estep, who was Medevac'd at 1628 hours. Effective at the time of Medevac, the Battalion S-3 Air Officer, CPT Paul Ogg, (picture - information) took command of the company in the field. The 1st Platoon of D Company was released at 1734 hours and returned to the control of their company. C Company set up their NDP and placed an ambush between the company perimeter and Pho Trach (2) but there was no contact during the night. This is a copy of the map carried by CPT Estep. As was the norm, CPT Estep's map was covered with acetate. This not only kept the map waterproof, but allowed him to use grease pencil to make notes of locations, air movements, and other information. In the lower center of the map can be seen a smudged note in blue grease pencil saying "2 KIA, 3 ???" (probably WIA). It is unknown who wrote that note, but it is written next to the name Pho Trach, the village near which the firefight took place. The map is an extremely large file - it may take as long as eight minutes to download it over a dial-up connection. This is an extremely large file! Killed in action on March 9th were SP4 Melton Howard Presley, PFC Lawrence Scanlon, and PFC James Ronald Bateman. Wounded and evacuated was CPT James Estep, the Company Commander, 2LT Thomas Magtarak, and PFC Wallace Zajag. (Source: Ken Burington; Comanche Six - Estep, and DA Form 1 dtd 9 March 1968)) SP4 Jay Phillips was CPT Estep's RTO and was awarded the Army Commendation Medal with "V" Device by General Order 5810. According to At about 3:30 in the afternoon, Comanche's 3rd Platoon was pinned down near Van Trinh, and broke contact with the enemy so they could bring in ARA and artillery. By 4 PM, they had withdrawn. However, at 5 PM, the company requested a medevac. According to the radio logs from Mar 14, 1968, at 1535 hours, "3rd Platoon was pinned down at YD516470", near the village of Van Trinh about 7 klicks inland and just north of Da Nang. C Company was ordered to withdraw with Helos on station to provide ARA. 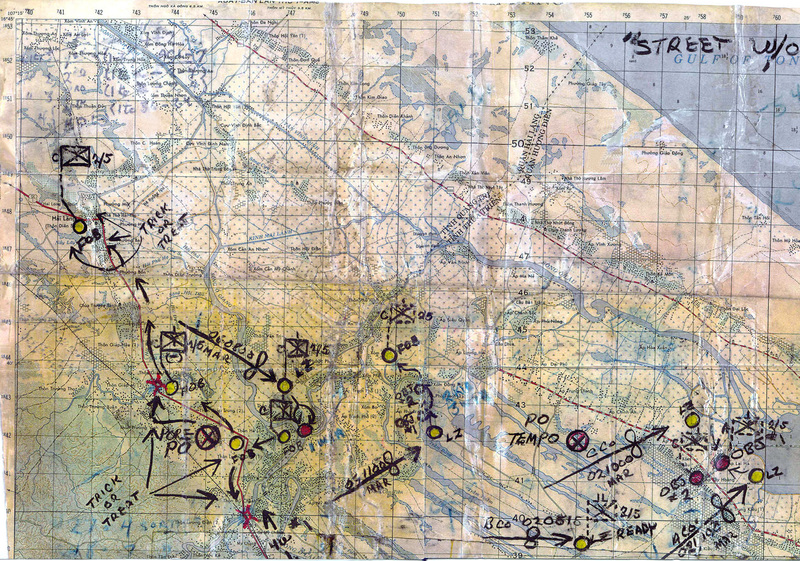 At 1542 hours C Co reported the enemy location at YD518470 and "3rd Platoon as being just west of that location". At 1604 hours, "C Co has broken contact and is withdrawing to YD510463". They complimented the ARA and Artillery will be put in to level the village. Unfortunately, at 1712 hours, "C Co requests Medevac..."
What had happened was that during the fire mission to level the village, on one of the launchers, a rubber star connector on a coupling failed, causing that launcher to fire off to the side of the fire zone. The ship was immediately sent to Subic Bay for the investigation during which the problem was found. All of the rubber star connectors were replaced and the ship returned to the line. I hope that this will provide some info to those that were left in the dark about exactly what had happened. I see from your website that there were 2 KIA and 1 WIA. It isn't much, but I give my heartfelt condolences to them and their families and the rest of C Company. Unfortunately, as you guys well know, in war, crap happens. I know that it doesn't help much, but this is the best that I can do. If any are interested, search for "USS Carronade IFS1". Bernard Howlett, GMGSN, US Navy. 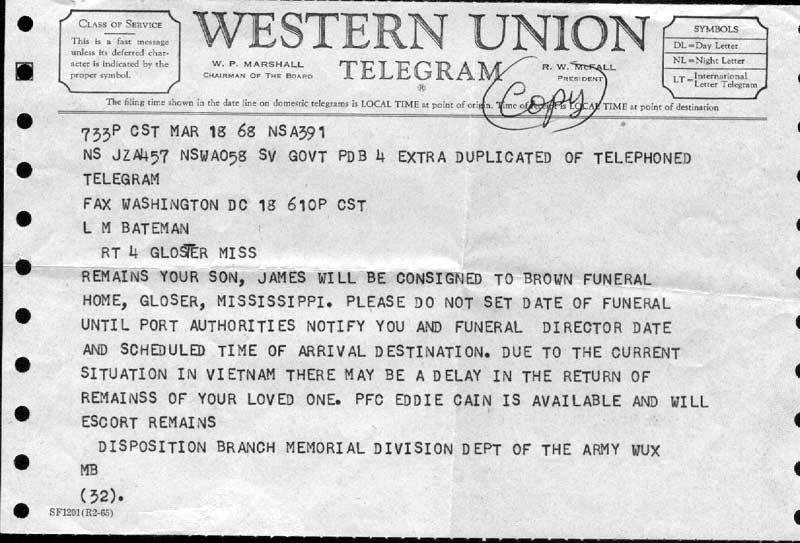 PFC Eddie Cain is assigned the task of escorting the body of PFC James Bateman back to the United States.